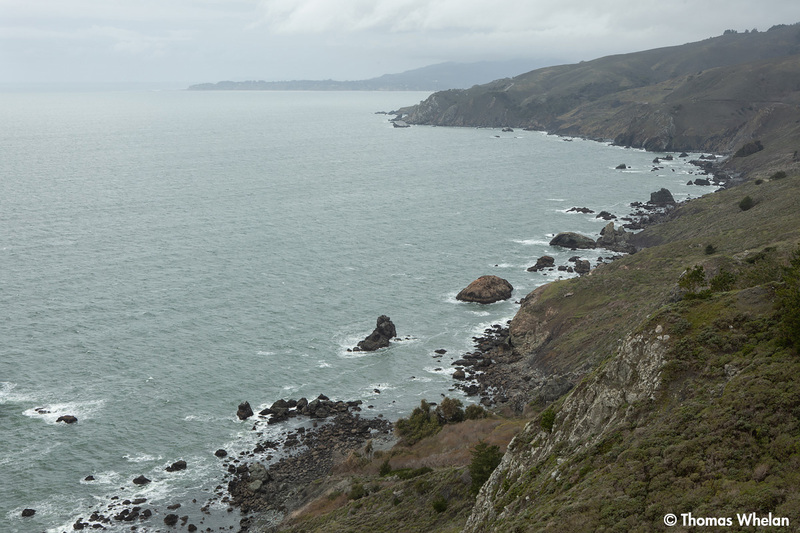 Nature Diary | Notes from the field, essays, and observations. I took these on two mornings, starting out under cloudy skies on each day. Then the sun came out, making for challenging lighting, I used a diffuser to reduce the light for some of these. 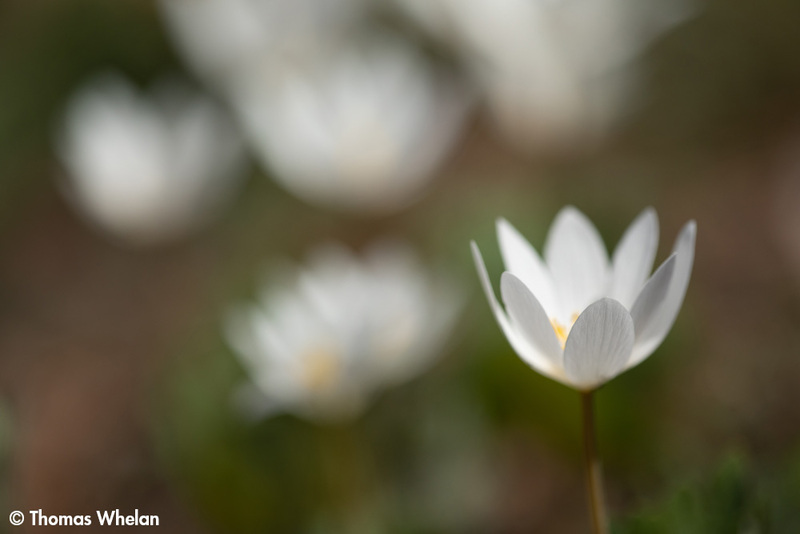 There were hundreds of bloodroot (Sanguinaria canadensis) blooming in this spot, quite a sight. At Garden in the Woods, I found only a few bloodroot, but there were some pretty hepatica. 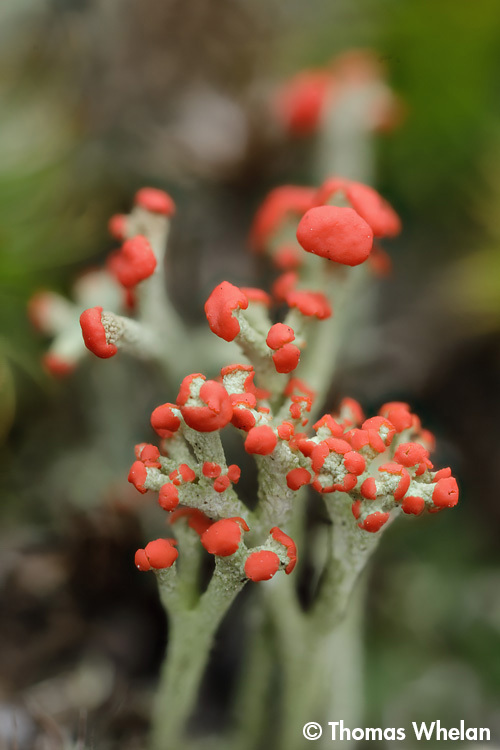 I look for this lichen and cup lichens in mosses in dry upland areas – pretty easy to find. Spring is here in my area, but it’s just beginning. Garden snowdrops and witch hazel are blooming, and willow catkins are out, but most spring wildflowers are weeks away. I found the common willow catkins in the wild, but the rosegold willow catkins (Salix gracilistyla) are from Arnold Arboretum in Boston. Rosegold willow is an asian species. The red-then-gold anthers were worth a drive into the city to see. Enough of California, back to chilly, Northeastern subjects. The weather has finally started to change here, it’s the beginning of mud season, the prelude to spring. In a shady spot, the frost was melting as I photographed. The crystals formed on a bump on the leaf. 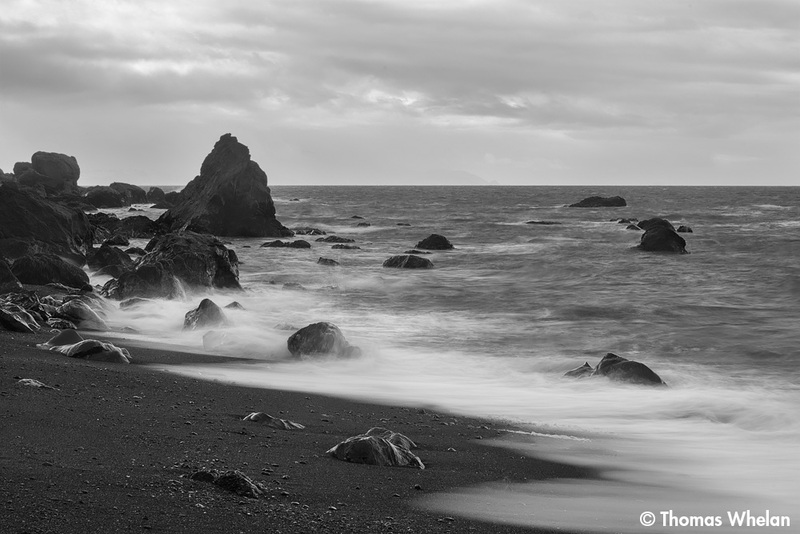 I used a long exposure to give the surf a misty look, and converted to black and white. I’ve left this in color, so you can see the few bits of leaf, such as the tip on the upper left. And here’s the story of how I got into tromping out into 5 degree Fahrenheit weather to photograph ice crystals. 1. Snowflakes – The prelude to my crystal story. 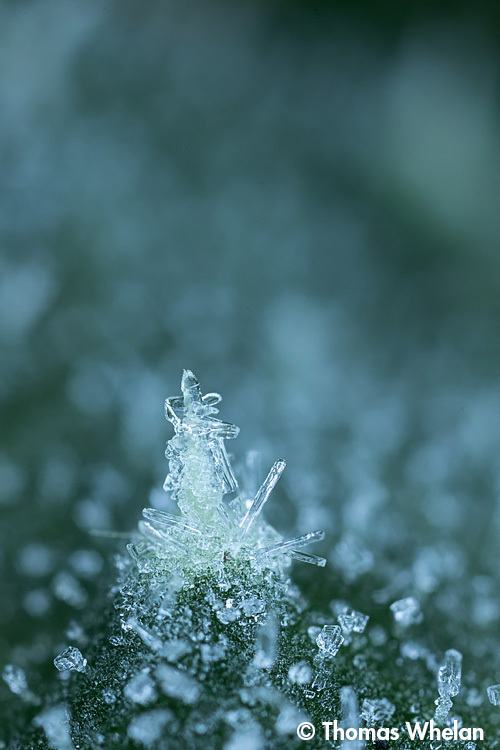 Snowflakes are perhaps the most familiar ice crystal form – a hexagonal shape. Snowflakes form in the sky, but the most of the crystals that form on terrestrial objects have a recognizably hexagonal form. These snowflakes fell on a slender branch and are highly magnified. 2. 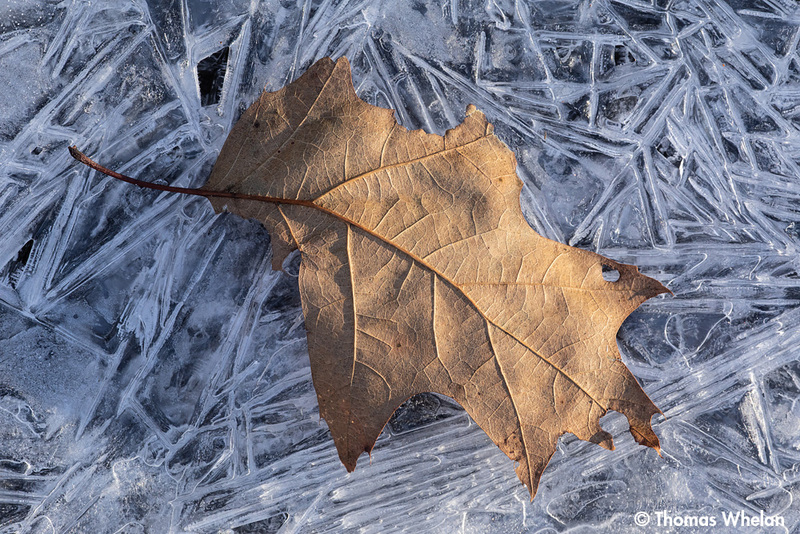 The leaf and the star – The real start for my story is this image of stream ice. I’d been photographing the swirling, curving patterns on steam ice – but what was the spiky star at the bottom of the beech leaf? 3. Ice stars – When it gets quite cold, under 10 degrees Fahrenheit, the icy surface of the stream sprouts stars: crystal spikes that radiate from a center. Sometimes there are clusters of them, sometimes the spikes overlap, *matting the stream surface* with crystals. 4. Crystals on snow – When it gets colder, zero to 5 degrees Fahrenheit, crystals can accumulate on the snow by a stream. Some of the crystals have feathery shapes. The feathery crystals are the ones I love best. They are relatively rare, and need a combination of conditions to form. Lack of wind may be a factor. If it’s windy at night, stars and spikes can form instead. 5. Crystal feathers or ferns – An extreme closeup of a fern-like shape on snow at the edge of a stream. It looks like a snowflake, but it crystallized on earth from water vapor from the stream. 6. Feathers and ferns – The feathery shapes can form on twigs and other objects. This twig was above a brook. 7. 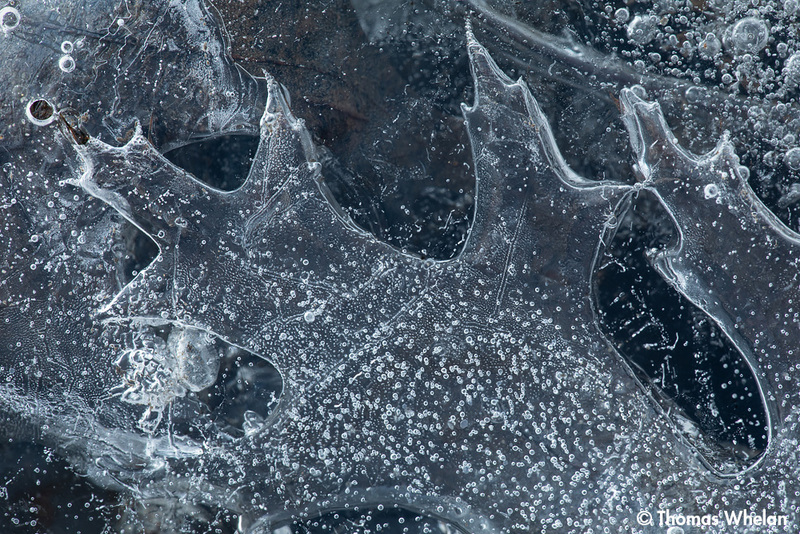 Leaf crystals – A leaf on the stream surface with crystals at the edge. The ice crystals can be diverse – a combination of feathers, spikes, and rays. 8. Crystalline pipes – These hollow hexagonal pipes formed on a stem. This was taken in a field near a wetland. 9. Pipes on a frozen drops – Crystals can form on frozen drops if the temperature drops quickly from near freezing to a much lower temperature. 10. Plates on a grass blade – From the same field near a wetland. Crystals can form in clear hexagonal plates. 11. Foxtail frost – More plates on a foxtail in the same meadow near a wetland. I keep going back in such ridiculously cold weather because of the variety of the crystal forms. They are like flowers, but unlike the more or less predictable succession of wildflowers, I only can only guess what I’ll find when I go out on a cold morning.